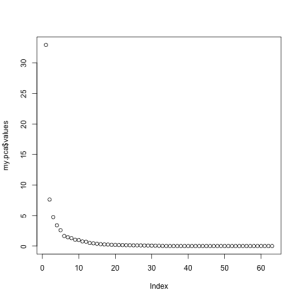 Running a PCA-ANOVA in R is fairly straightforward. In this post we’ll focus on doing a temporal PCA on clusters of ERP channels. First you will want to arrange the data in one file. If you are coming from Net Station, you can export your ERP averaged files to text and then use MCAT to create averaged channels to input into the PCA. MCAT does three things that are useful in this case: 1) MCAT creates average channels; 2) MCAT rotates the channels so that the columns represent time, instead of the EGI default method of columns representing different channels; 3) MCAT will concatenate all of the subjects together. By default, MCAT creates 10 channels from a 128 channel EGI Net. It is simple to modify the number and composition of each channel, but for the purposes of this walkthrough, we will use the defaults. The default are 5 channels per hemisphere, representing Frontal, Central, Temporal, Parietal, and Occipital regions. In this example, we have 24 subjects and they see two conditions: congruent and incongruent. Stepping through this command, this will run a PCA on time points 26-150, skipping every other time point. I chose these values because my ERP included 100 millisecond baseline, recorded at 250Hz, breaks down to 4 milliseconds per sample, 25*4=100. We don’t want to include the baseline in the PCA for this example. I skip every other sample because of the high temporal correlation in the data and skipping every other value will give you plenty of resolution to detect the “slow” ERP components. You should feel free to try it both ways. Next, we are going to start with 5 components and use a varimax rotation, which will force the components to be orthogonal. Finally, this is running the PCA using a correlation matrix, the alternative is to use a covariance matrix. The result is that a correlation matrix will add a bit of normalization to your PCA. Truthfully, I had some difficulty getting the covariance matrix PCA to give me the same values as other software packages (e.g. SAS). The Correlation Matrix results were almost identical to SAS. I’ll debug this later. At this point, we need to see if 5 components correctly captures the variance of the original data. To do this, most people use the Scree plot, originally developed by Cattell. The general idea is to retain the factors until you reach the point where the rocks would collect at the base of a mountain. Alternative solutions to choosing the number of factors are 1) retain values until you reach an Eigan Value of 1.0; 2) retain values until you account for a pre-determined percent of the variance. Both of these methods will unfortunately leave you with factors that account for very little variance. The validity of using these low-variance components for later analyses is arguable, though I tend to avoid using them. You can see in the scree chart below that we would choose between 5 and 6 components. For the sake of ease, today I will choose 5. At this point, the PCA has created 5 factors that represent each CHANNEL (or averaged channel) for each condition, for each subject. Going into the PCA you had 2 conditions, 10 channels, and 24 subjects, which was represented as 480 rows in the input file. Now for each of those 480 rows, you have 5 values, representing the data reduced time course of each channel within condition within subject. The next step is to rename these factors to represent the appropriate channel and conditions as well as organize them into one row for each participant so that you can do repeated-measures ANOVAs on the data. The following code rotates the matrix, to make renaming easier. Then we cast the data frame as a matrix and re-specify it to be 24 rows (the number of subjects). Then we send it back to a data frame and add “labels” to the data frame representing each channel, condition, and factor. Channels are here labeled as the first two letters, so FL would be “front left” and so on. 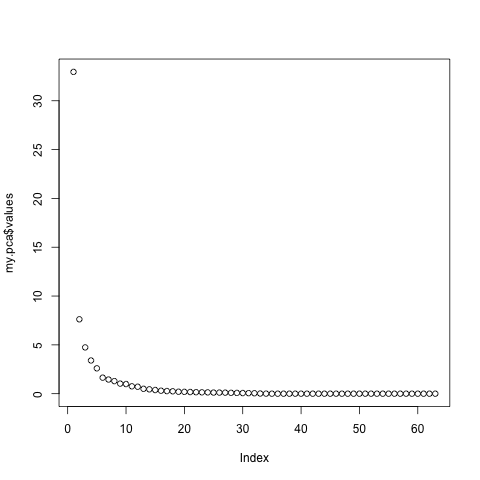 These three lines breakout the first factor into a second dataset. We then use melt() to convert the data from wide format to long format. Next we need to add some descriptors to the data, these are variables in long format that serve to describe characteristics of that particular data point. I use rep to do this and exploit the organized format of the data. Using the code below, I add variables region, hemisphere, and condition. You could also do this with a series of functions of if/then or ifelse() commands. Finally we are ready to actually run the ANOVA on this first factor with a condition X hemisphere X region repeated-measures design. The results are nicely printed out, a subset is shown below. We have identified a main effect for hemisphere as well as region, these are qualified by a hemisphere X region interaction. Most people seem to agree that a loading of 0.4 or higher (absolute value) are worth reporting. Next EEG post, I’ll show how to do the same analyses using the ERP PCA Toolkit that was talked about before.